Small-space living doesn’t mean you have to suffer in a cramped, uncomfortable home. 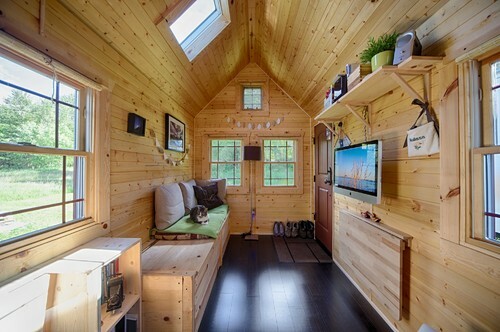 Even if you live in a tiny house, there are lots of ways to set up a room so it feels larger and has more functionality. 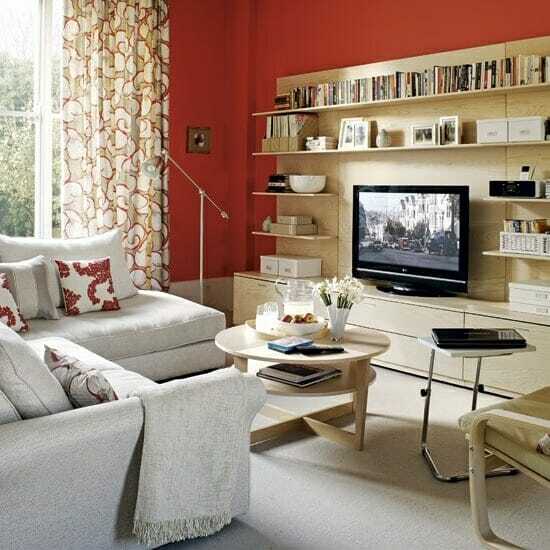 For this post, we’re focusing on small living rooms. Check out some of our favorite ways to maximize that space. An entertainment center should easily hold the television, stereo, gaming components, and all those additional accessories that are used with the television. 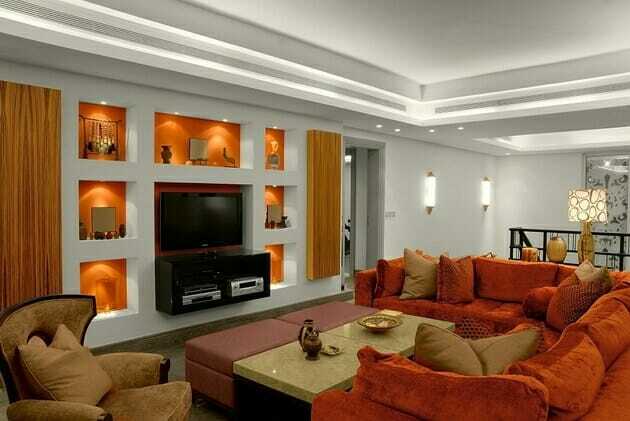 Start stacking the shelves as high as the ceiling and place many of the other items taking up space in the rooms. This means place plants, books, vases, pictures, and knick-knacks on these shelves. Not only does it help to remove the clutter from the room, it instantly gives the small room a cozier feeling. Because you can go as high as you like on that wall, you can remove virtually every other small item that is taking up space and easily place it on the wall of shelves. Want to get this look? Check out the Ikea BESTA system. If space is a premium in your rooms, consider building shelves that take up zero additional space in the rooms. This requires some modification to the walls, but by cutting squares, closing them in, and repainting to match the rest of the room, these cut-outs become instant shelves for storing pictures, books, candles, and the rest of the items around that room. Adding spotlights will help showcase your favorite items in a very unique way. The biggest benefit of creating these custom cut-outs in the wall is that no mater how many that you create, you are not taking up a single inch of new space in the tiny rooms. Contact a local home improvement contractor to make this happen. Unlike a traditional entertainment center that only takes up a portion of one wall, a custom built-in fills the entire wall and allows you to make as many shelves and cabinets that you like. Cabinets running along the bottom of the wall unit are perfect for hiding all those television accessories like VCR, DVD, gaming counsels, and stereo components. The shelves allow you to bring in all the books, pictures, candles, and decorative pieces that might be taking up space on tables in the rest of the room. Remove all the clutter and fill up your new wall center, cut-out, and shelves, with everything taking up space elsewhere in the tiny house. Skip the enormous recliner sofa and go for small, functional pieces that are still big on style. 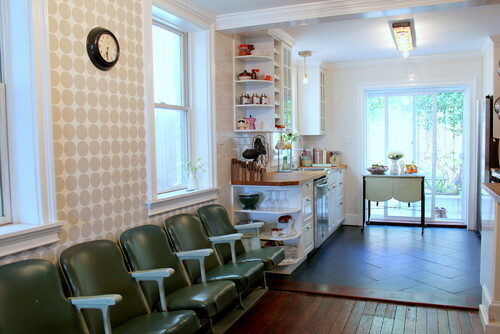 We particularly love the vintage theater seats pictured above since they can fold up and take up even less space. Plus, they had vintage charm to the room. Find similar seats on Craigslist or at an antique shop. Look for furniture that does double-duty like the ottomans above that are also coffee tables. When guests come over, you can use them as extra seating. 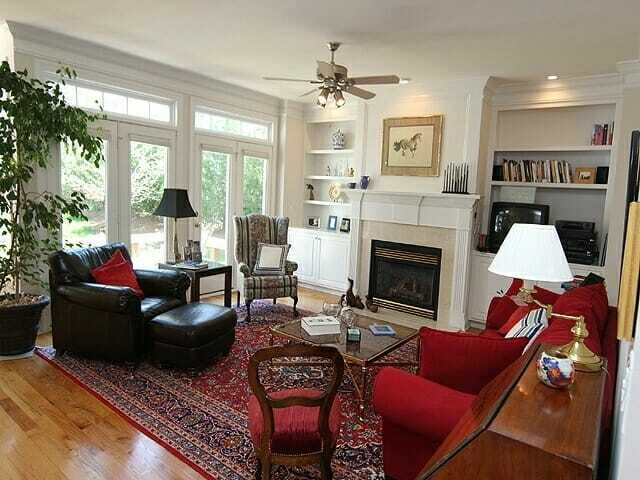 They can also be pushed close to the sofa to create chaise lounges. For truly tiny spaces, call in the big guns. The sofa seat folds up to reveal a storage box, and a dining room table is sneakily mounted on the wall under the television so it can be folded out when needed. A skylight helps open up the space, and high shelving helps hold stereo equipment and decorations. Have a tiny living room? What have you done to maximize the space? Share your tips with us by leaving a comment.